In 1860, at the age of 24, Louis-Ulysse Chopard created the L.U.C watch manufactory in Sonvilier and established it as one of the finest watchmakers in the 19th century. However during the 20th century Chopard suffered a period of decline until 1963, when it was bought by Karl Scheufele. Along with his wife Karin and his two children, Karl-Friedrich and Caroline, he turned it into the brand you know today. In order to mark the grand milestone of Chopard 150th anniversary, they have created a new jewellery collection, whih using some animal pieces as theme. Caroline Gruosi-Scheufele, Co-President and Artistic Director, has chosen the animal theme. Sourced from encyclopaedias and the Chinese calendar, it is the largest and most diverse collection Choaprd has ever devoted to. The 'Animal World' Collection also put to use some unexpected gemstones including quartz, kunzites, pearls, Paraiba tourmalines, moonstones, red gold, titanium, and precious woods designed to evoke a “natural” effect. 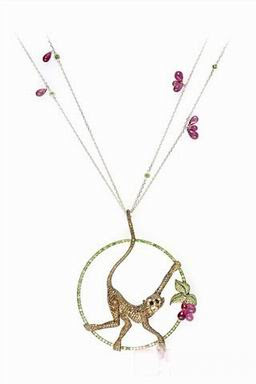 Chopard has designed 150 such animal-themed pieces collection for the anniversary. The Clownfish plastron necklace is a particular highlight in the collection. 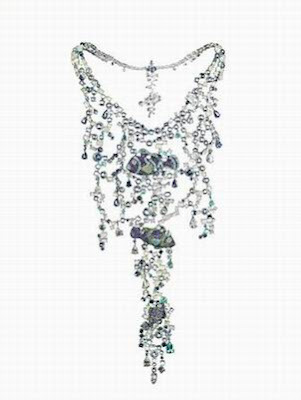 It took 750 hours to create and using 2160 various stones such as diamonds, apatites, aquamarines, chalcedonies, moonstones, Paraiba tourmalines, quartz, topazes and sapphires. In another scene, the chimpanzees have stretching out hand to reach a bunch of mangoes that made by a cluster of orange-red sapphires.